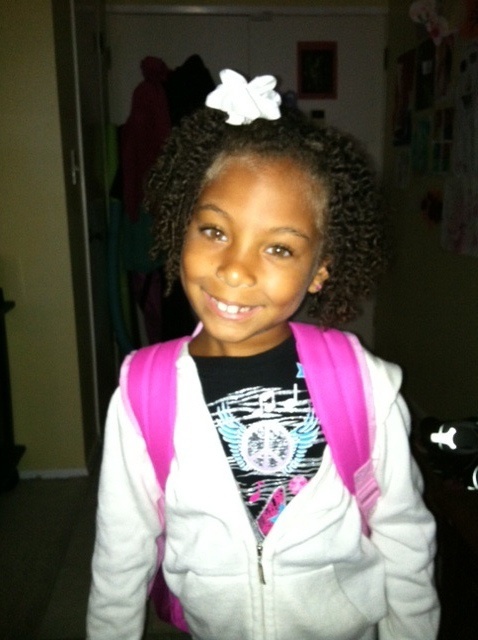 My daughter, who I have coined Ms. Prissy, is attending a new school for first grade. Throughout the summer, she was anxious about leaving her former school and making new friends. So, as the pre-emptive woman that I am, I went into overdrive to get her prepared for what I knew would be an emotional experience for her. I made play dates with her future classmates, she chose a new book bag and lunchbox for the occasion, and we visited the school together a few times and even met her new teacher before the first day. “I know, baby,” I said calmly. “ It’s natural to be scared before starting a new adventure. Or doing anything new. But you will be fine and make a lot of new friends. I am sure in a few weeks, you will love the school.” She gave me a hug and we headed out. I calmly went to the passenger side and opened her door. Kneeling at her seat, I gave her another reassuring hug. “Honey, it will be okay. “ I am here and Auntie is here. We are going to walk in there together.” She got out of the car apprehensively. And as my body shifted to leave, she dug her razor-sharp nails into my arm and commanded, “No, you aren’t going.” I looked up for her teacher for help, but she was welcoming another family that had just arrived. “No, Mom, no” she pleaded. Then the tears began to pour. She pulled both my aunt and I to a corner, positioning us like a shield between her and the class. I tried a desperate tactic. I started pointing out books on the shelf that we had at home. “You know all these books.” You will love it here,” I said. But my daughter was focused. Focused on me leaving and new children flooding the room. As her tears continued to stream down her face and I kept up my measly attempts to reassure her, it happened. My eyes began to swell up and my strong front was broken. I began to cry. Some other parents saw the emotional scene and came over to welcome us. One mother began patting me on the back and reassured us both. I wanted to scream out, “ I am not that mother!” But I could not get it together to save my life. When did I become the crying parent at the school drop-off? This whole time I thought I needed to be preparing my daughter for her first day jitters. It turned out, I failed to prepare myself for feeling inept at helping my baby when I am unable to make it all better with Mommy’s words, kiss or hug. I wiped away my tears as the teacher came over to help diffuse the situation. She told me I could sit outside and get a coffee. Ugh! I couldn’t hide my embarrassment no matter how hard I tried. But I managed a weak goodbye and left. My daughter made it through the day and she now loves her new school. And I got schooled, too. I will no longer judge all those “hysterical” mothers because I know now that I am one. What am I going to do when it’s my youngest daughter’s turn to go to a new school? Somebody send me a box of tissues and an Ativan. Beautiful story. I am not looking forward to that day but know to prepare myself for the emotions. The good news is that you have had a dress rehearsal before bringing your daughter to Spelman. We invented “The Parting Ceremony” for Spelman parents so they would leave without camping out in the dorm rooms at the end of Freshman orientation week. At least, by the time your younger child starts school, she will have her BIG sister to lean on. As a second child,I assure you that we adjust faster than THAT Mother. Lovely story … and I HIGHLY recommend this book for dealing with separation anxiety. It’s a WONDERFUL story! it will be a breeze with sage! Can’t wait to read this aloud to my kids. This is spectacular!! Too cute… don’t worry, it’s not as easy with the 2nd or in my case 3rd child…but you can manage. Tip: drop her off and run! By time you realize you want to cry you will be the car. LOL!! I understand what you feel so well my friend. I had become every single thing I was against to. The dramatic mother, the difficult mother, the paranoid mother, etc. Then with time I realize it was just a little step to grow up as a mother. I sure hope I get better with Nelli, but it is hard to say because every child is a different experience. You’ll be fine and believe me you are doing a great job as a parent. A great story as your many others. Sometimes its when we are most focused on them that we are most vulnerable. I had a very similar situation occur and I felt so embarrassed. Just a reminder of what a big yet wonderful job it is to parent. Well done, Mom! I was wondering where you guys were! Great story, but we miss you so much!!! I love the story! Totally understood, cute and funny too lol! What an honest and heartfelt depiction of some of the challenges that we face as compassionate parents! How powerful (re-framing your feeling of being a “hysterical” mother)it is for your daughters to experience your compassion and support (amidst tears at times)! It is funny how the universe “checks us” when we say “never” just like I used to think (pre-motherhood) of mothers with screaming children on airplanes (smile). I love your stories. I am all of those mothers and I still cry when my kindergarteners go off to big school. I stay on alert until I hear that all of my special “babies” are doing fine and have adjusted. Good Job, Skye! Awesome, Calida!!!! You’ll be fine with Sage because you’ve gotten over that hump! You’ll just be able to hold it in a little longer!!! Do take tissues just in case!!! LOL!! !